Miigwetch for visiting the “Chippewas of Nawash Unceded First Nation Board of Education” website. This page has been designed to give its viewer’s some general information regarding the Education Department and its programs. Should you require further information, please do not hesitate to contact our office. Our mission is to foster a nurturing and supportive learning environment that inspires dedication to lifelong learning, Anishinaabemowin and the values of mino bimaadiziwin. Building Anishinabek Success…Voices For Today and Tomorrow. 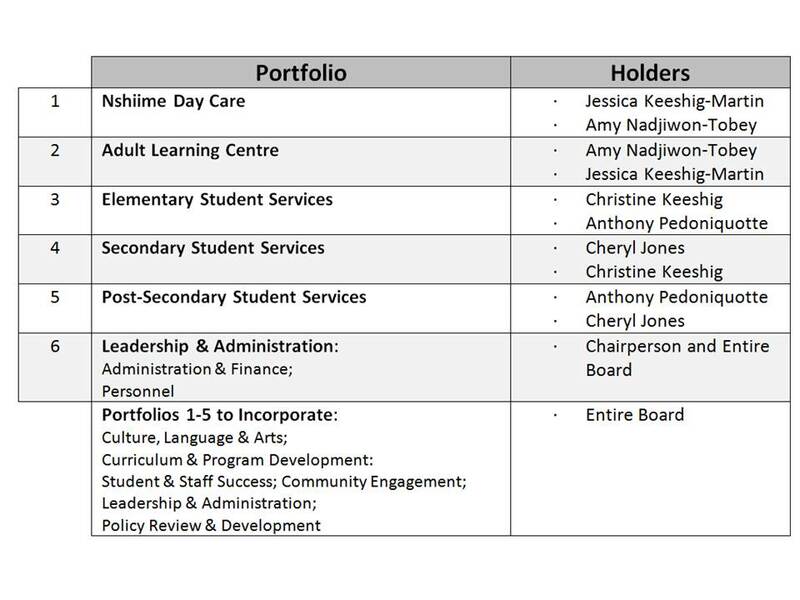 The Chippewas of Nawash Unceded First Nation Board of Education held their first Board of Election on December 15, 1993 when the local Council relinquished their educational governance to the Local School Board. A “Memorandum of Understanding” was updated and renewed each election term. In 2018, the agreement was revised and a Term of Reference was agreed upon between Council and the Board. The Terms of Reference outlines and clarifies roles and responsibilities of each party. Post Secondary Coordinator – Jennifer Linklater. Provide financial assistance, subject to the availability of funding, to eligible Chippewas of Nawash Unceded First Nation band members in pursuit of Post Secondary education. Assist Post Secondary students with the tools and resources necessary to graduate with the qualifications comparable to other Canadians with similar educational and socio-economic backgrounds. Improve the employability of the Chippewas of Nawash Unceded First Nation band members by providing eligible students with access to education and skills development opportunities at the post secondary level. This is expected to lead to greater participation of students in post secondary studies, higher Chippewas of Nawash Unceded First Nation graduation rates from post secondary programs, and to improve individual, family and community well-being for band members. Ensure that a maximum number of Chippewas of Nawash Unceded First Nation band members are approved for assistance under the NPSAP criteria. The NPSAP is not a full funding program. Students who have educational costs that are higher than the maximum allowances under the NPSAP are encouraged to seek and secure supplementary financial assistance. Please see Appendix A for a list of scholarships and bursaries. Direct Deposits for Living Allowance will be deposited on the last business day of the month for the upcoming month. Book Allowance for eligible students will be deposited for September and January with the living allowance payment. Book receipts are no longer required. Spring/Summer 2018 Final Marks are due no later than September 15th, 2018. Spring/Summer 2019 (May – August) Applications for financial assistance are due: March 1st, 2019. Fall 2019/Winter 2020 (September – April) Applications for financial assistance are due: May 1st, 2019. 2018/19 F/W Post Secondary Application: Please complete and submit all required or outstanding documentation for your application by October 31, 2018, Midnight. Incomplete applications will forfeit their spot and the next completed application will be taken from the wait-list, by priority and according to the date received. For eligibility, please note: Policy No: S.S.S. No. 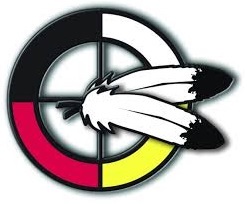 4.01.01 – The Board shall provide assistance to Band Member secondary students who reside on the Chippewas of Nawash Unceded First Nation reserve. Other First Nation Band members and non-band members who are residing on the Chippewas of Nawash Unceded First Nation territory are entitled to transportation and tuition only. Non-Members must secure residency via a B.C.R. from Chief and Council. Band Members residing in Neyaashiinigmiing are entitled to assistance if enrolled in the Bluewater District School Board (PSDS) or the Bruce-Grey Catholic District School Board (SMHS). A “Release of Information” form is provided to students and parents for signature which acknowledges that the consent form is signed indicating that the SSSC has access to the above files. Students and parents that do not wish to sign the consent form should present the SSSC with proper documentation that indicates that the student is eligible for student assistance such as confirmation of enrollment, attendance and report cards. Monday’s: Board of Education Office (519-534-0882) Neyaashiinigmiing. Tuesday’s & Thursday’s: Peninsula Shores District School (519-534-2205 ext. 612) Wiarton, ON. Wednesday’s & Friday's: St. Mary’s High School (519-376-4278) Owen Sound, ON. Weekday's 8:30 - 4:30, by cell 519-375-0334. Please remember to collect your student volunteer hours. Grades: Jr. Kindergarten – Grade 8. 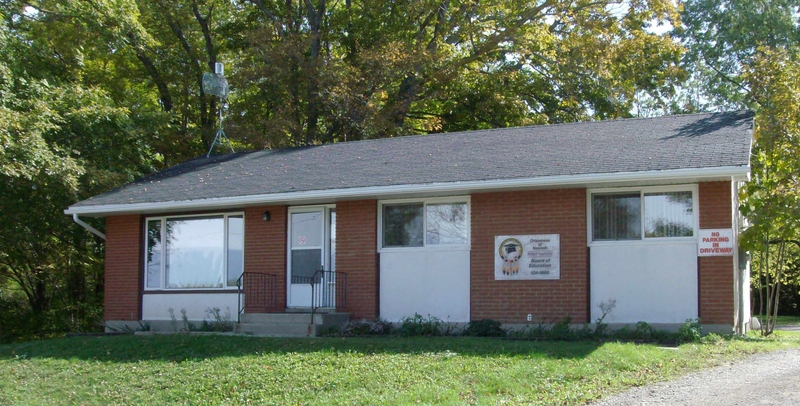 The Kikendaasogamig Chippewas of Nawash Unceded First Nation Elementary School offers Ojibway language classes; various mainstream and special education programs and take measures to incorporate cultural education into their school. Education Assistants - Paula Keeshig, Sandra Lavalley, Greg Millar, Diana Millar, Patrick King. School Secretary – Marylynne Pedoniquotte. Facsimile: 519-534-1592Web page: www.nawash.ca -see Kikendaasogamig Elementary School. Facsimile: 519-534-5138Web page: www.nawash.ca -see Education. Board Meetings are held on the first (1st) and (3rd) Friday of the month from 9:00 am – 12:00 pm. These Board Meetings are held in the boardroom of the Board of Education Office. Special Board meetings are scheduled as needed. Band member requests can be placed on the agenda for either Regular or Program Report Board Meetings. Please submit a letter of request or notification if special accommodations are required to either the Chairperson or the Education Administrator one week prior to the meeting. This will provide an opportunity to prepare for general accessibility needs, and allow the Board members time to read the information and address all issues in a timely manner. Note: “Impromptu requests” for the agenda will be at the discretion of the Chairperson. Parents/guardians, students, staff and community band members are welcomed to attend any Board meeting to observe and listen to proceedings that are not “Closed” or “In-Camera”. Due to the Ralph Akiwenzie Scholarship deadline falling on a holiday (Friday March 30, 2018), applications will be accepted up to April 3, 2018 at 4 PM EST. This scholarship is named after former Chief Ralph Akiwenzie who, as an educator and leader, dedicated his life to our community. You have met the college and/or university entry requirements, and are applying to any Canadian college or university, and are working towards your diploma, undergraduate degree, Master's, PhD, or Native Language Course/Diploma. Each scholarship covers up to $3,000 or 80% of the subsidy costs, whichever is less, and is renewable annually, based on reasonable progress toward the completion of an undergraduate degree or diploma. You MUST apply each year. If you were a successful candidate in the past you must submit your receipt(s) and a copy of your grades to be eligible to reapply for the scholarship.